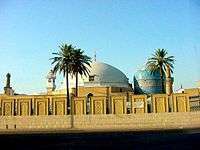 The Galibi Order of Sufism is a descendant of the Qadiriya and Rifa'iya orders – the integration of the earliest and the most popular orders established in Islam. It has been called as Qadiriyyah-Rufai order until the order branched off its ancestor school in 1993, and began to be called after the name of its sheikh, Galip Hasan Kuşçuoğlu. The Order's central dargah is in Ankara and it has various branches throughout Turkey (e.g., Istanbul, Çorum, Adana, Gaziantep, Kütahya, Isparta, Antalya). The Galibi are Hanifi in fiqh and Alevi in disposition.